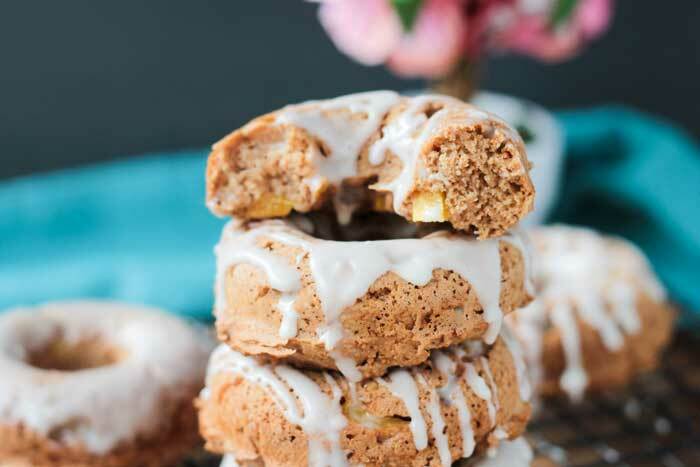 Peaches and Cream Dairy Free Donuts – tender cake donuts made with easy to digest spelt flour and fresh diced peaches baked into every bite. 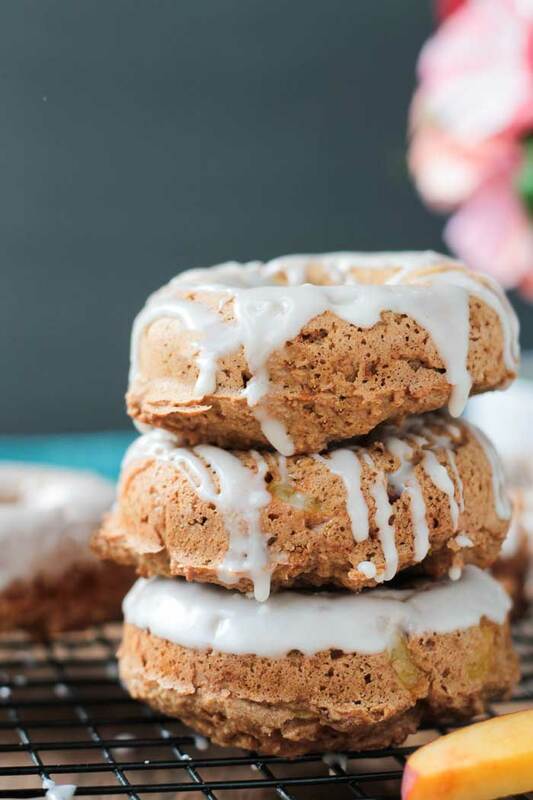 An easy, sweet glaze takes these vegan donuts over the top! I can not stop eating these Peaches and Cream Dairy Free Donuts!! This might be going down as one of my top 5 recipes from the blog. They are so good! I’ve never been a huge donut lover – I find them either too dry, too sweet, or too oily. These peaches and cream donuts are everything I’ve ever wanted in a donut – light and fluffy, just sweet enough, and absolutely no oil, butter or eggs. You’ve got to try these! I love spelt flour for baking because it’s much lighter than whole wheat and more easily digestible. Some people who are sensitive to gluten, will find spelt flour easier to tolerate, however, it is NOT gluten free and therefore not suitable for those with Celiac disease. 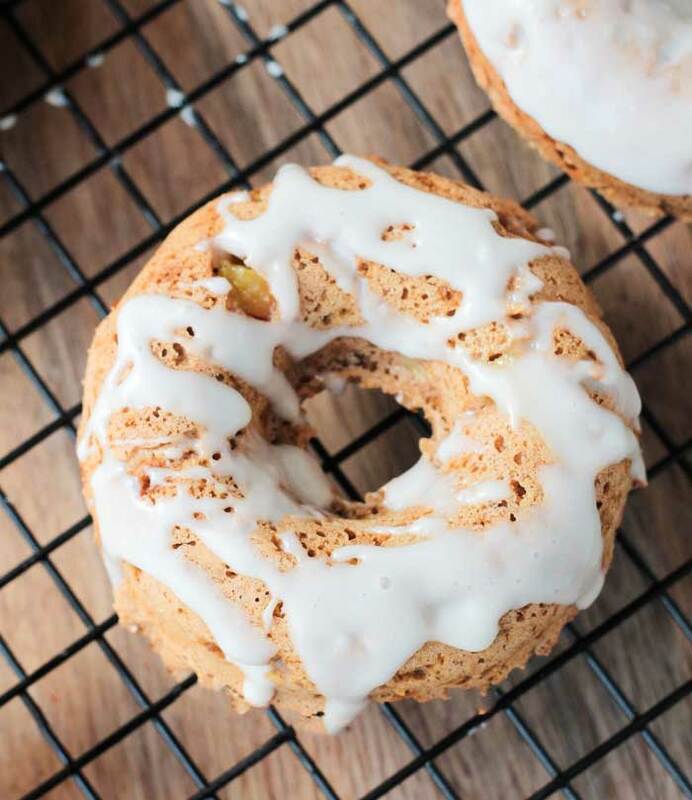 It does make these dairy free donuts nice and tender while still allowing them to hold together perfectly! You all know by know that I’m obsessed with aquafaba (a.k.a chickpea brine) when it comes to baking. I’ve used it in my Cinnamon Squash Bread, Peanut Butter Chocolate Cupcakes, and Clementine Loaf Cakes. Aquafaba is used in place of eggs to create a perfect soft, fluffy rise in baked goods. It works like a charm in these donuts as well! Coconut milk is a magical ingredient in its own right. It provides healthy fat which allows for a tender cake texture without using butter or oils. What we have is soft, tender, moist, fluffy, yummy, baked dairy free donuts. 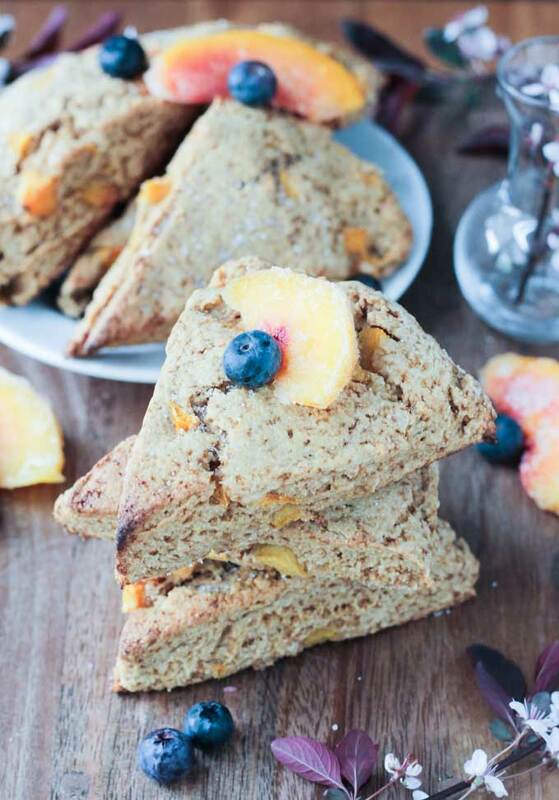 They are perfect for breakfast, snack or even dessert. We have been eating them all day long. The first time I made them, I made a second batch about an hour after the first because we just couldn’t stop! You might want to do yourself a a favor and just start with a double batch! 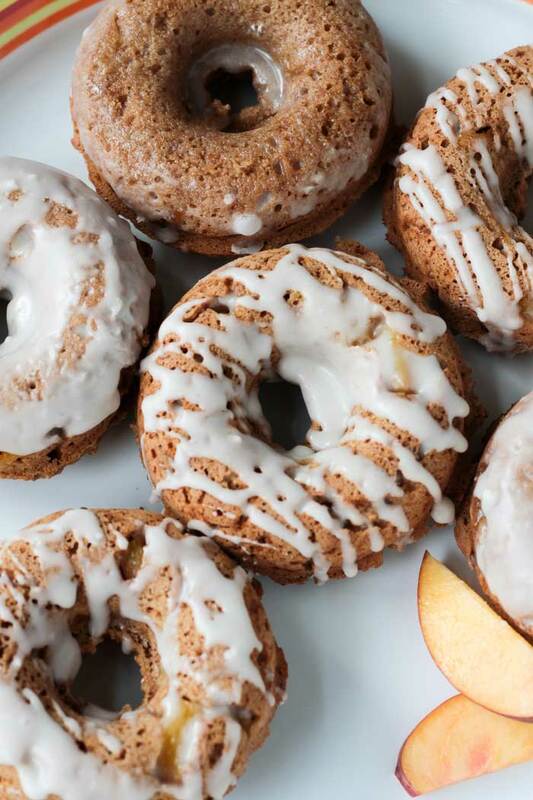 I can not wait for you guys to try these delicious dairy free donuts! Please come back and leave me feedback and star rating after trying them! I love seeing your pics too, so if you make this, be sure tag me on social media #veggieinspired and @veggie_inspired so I don’t miss it! Lightly spray a 6-cavity donut pan with cooking spray and set aside. In a small mixing bowl, whisk together the flour, coconut sugar, baking powder and salt. In another mixing bowl, whisk together the coconut, aquafaba, and vanilla. Add the dry ingredients to the wet and stir until combined, but do not over mix. Add the diced peaches and stir to distribute evenly throughout. Spoon the batter into the prepared donut pan. Fill each cavity to the top and smooth out the top with the back of the spoon or your fingers. Bake for 11-13 minutes, until the edges pull away from the pan easily. (12 minutes was perfect in my oven each time). Let cool in the pan on a wire cooling rack for 5-10 minutes. Turn the donuts out onto the cooling rack and continue to cool completely. Once the donuts are completely cool, whisk together the powdered sugar and coconut milk for the glaze, if using. Gently dip the tops of each donut into the glaze and return to the cooling rack to dry. Alternately, drizzle the glaze over the top of each donut and allow to dry on the cooling rack. Find more Healthy Sweet Treats. I made these the other day without the peaches and added a cinnamom/date sugar topping to half of them, and dipped the other half in melted dark chocolate. Oh my heavens! So good! I want to make them for my mom for her birthday tomorrow but was just making my grocery list and remembered she doesn’t like coconut. I haven’t experimented much with milks other than almond or rice. Any suggestions to replace the coconut milk? Maybe cashew? BTW, I used light coconut milk in my other batch with date sugar and we loved them. Thanks for this recipe! Oh, that’s so great. Thanks, Sue! Good to know that lite coconut milk worked! I think maybe cashew milk or soy milk milk work. They need a little fat content to help keep them soft and moist, so I don’t think rice milk would be a good choice. Let me know what you use and how they turn out! Why do I have that old school song in my head while reading you post? HAHAHAHA!!! I’d gladly eat these and dance!! YUM YUM! Yummmm! Love donuts so much and these look so much healthier than traditional. Love using spelt flour too, it is amazing and gives the softest results! These are just perfect Jenn! Yes, super soft! I love it in baked goods Thanks, Brandi! These look amazing! Can you sub the peaches to make other flavours? Like chocolate or something like that? Those would be a problem for me too, but as far as doughnuts go, these are pretty healthy. YUM! Aquafaba is truly a miracle for vegans. Yes, definitely a healthier version for sure! But I still wouldn’t recommend eating the whole batch yourself. 🙂 LOVE aquafaba! Thanks, Linda! I would DEFINITELY start with a double batch! Forget all day, these wouldn’t last a morning with me! Oh my goodness! These sound DELICIOUS. I’m obsessed with peaches at the moment and the thought of them in donut form is just too perfect. Thank you, Aimee! They are seriously so addictively good!! I’m going to try them in muffin form next. Total drool! Spelt flour is great, Hauke. You would love it. You use it just like whole wheat flour, but it’s lighter with no after taste. Thanks!! Looks like I need to invest in a donut pan! Yes! I’m so excited to experiment with other flavor combos now too! 🙂 Thanks, Amy! Oh my gosh, those look sooo good! These look so comforting and delicious! 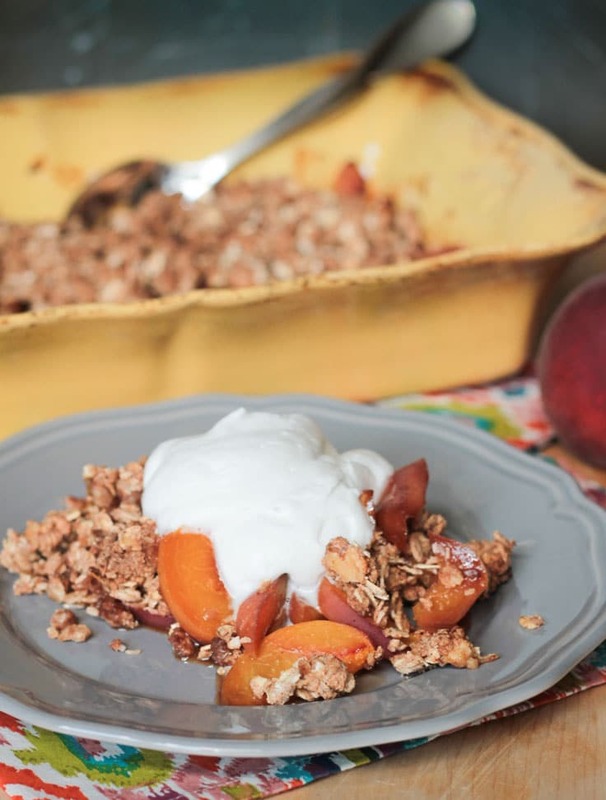 Peaches will be in season very soon here in Upstate NY, I can’t wait to give these a try! I have just started seeing them here and I couldn’t wait to get my hands on them! Thanks, Emily! Peaches and cream is so perfect for summer! These look so delicious! Thanks, Jessica! I love all things peach! These look so delicious! Love that drizzle of icing! I mean, who could say no to sweet icing? 🙂 Thanks, Lindsay! These look and amazing! I’ve totally jumped on board the aquafaba bandwagon recently and I’m loving it too! And that coconut milk glaze…delish! Yay for aquafaba! I don’t even try other egg subtitutes anymore – aquafaba is my go to and it works perfectly every time. Thanks, Sonali! I SO need these in my life. And I even have a much ignored donut pan beckoning me … and some overripe nectarines that could swap in I think! So funny you say that because those are the exact reasons this recipe happened. I am now super excited to start using my donut pan more though – it was so easy! I hope you love them! 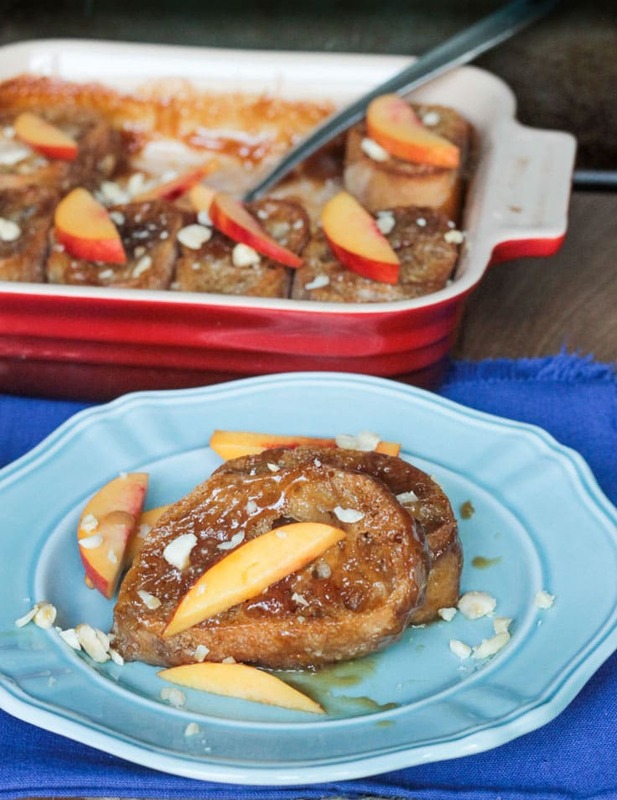 I haven’t had doughnut peaches before, but I’ve seen tons of recipes using them lately. I’ll have to be on the lookout for them. I LOVE the Trader Joe’s peaches that come in a box. They are different than the ones that they have loose in the bins. The box ones are soooo good! But they only have them for a short amount of time each summer. I do love nectarines too!